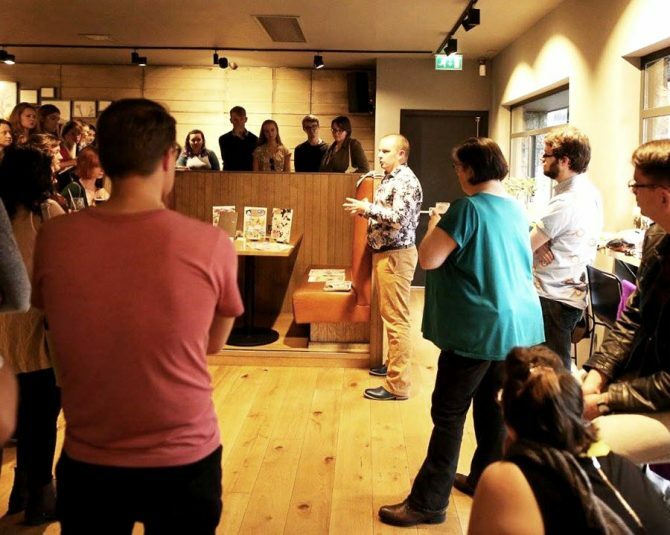 Creative Dundee’s regular Make/Share event brings people together to hear behind-the-scenes insights into the work of creative people from a mix of backgrounds. Make/Share will be running on Thursday and Friday afternoon every hour, on the hour from noon. Join a range of speakers for brief insights as they demonstrate their design processes. Marsali is a designer based in Dundee. She graduated from DJCAD studying Interior & Environmental Design in 2016 and has since been involved with Creative Dundee, Dundee Global Service Jam and Dundee Design Festival. Marsali has been working with Creative Dundee to design WRKSHP, a creative co-working and workshop space in Dundee Design Festival. She will introduce the space and talk about her design process behind the project. Kerry is a Raspberry pi enthusiast who loves to program and educate others about the raspberry pi and what they can do with them. She also enjoys tinkering with electronics and integrating them into things like robots. She is an active member of Dundee MakerSpace which is a social workspace for all people interested in making anything from electronics to art to furniture to software. Her talk will be about setting up Dream Digital, an educational space in unit 6 which she helped set up along with NEoN and Helm Training to teach a beginners game development course. Steph is a designer and maker working predominantly in ceramics. With an eye for colour and pattern, and focusing on minimal shapes, combined with bold patterns and a limited colour palette, she creates pieces which are easy to wear and live with. Working from her studio in Dundee, she makes each piece by hand before using underglaze to introduce pattern and illustration motif. Steph will talk about her recent research as she developed a new collection of work, which she’ll be launching next month at the Fruitmarket Design Market in Edinburgh. She’s been exploring new production methods and clay bodies – moving from making predominantly slab-built work in stoneware clay to slip-casting using Parian porcelain clay. Ryan runs a design studio called Slurpp making things that generally involve the internet, clever thinking and a sense of humour. Driven by an overwhelming desire to ‘never be beige’. Lyall Bruce is a Graphic Designer, Illustrator and Animator who sometimes works under the name Sooper Double D. Lyall’s work explores the boundaries of typography, character design and technology to achieve unique results. Ryan and Lyall are going to talk about evolving the identity of the design festival from last year, making it open-source and developing a unique website that looks to use the information generated during the festival in interesting new ways. Sara is the Programme Director for Textile Design at DJCAD, School of Art and Design, University of Dundee. Her role involves, teaching, managing the course, and research, it’s an exciting and rewarding job. Her research focuses on the development of smart textiles, which involves the integration of electronics, smart materials or functional materials within a textile structure or as part of the surface. Sara will talk about a research project that she’s been working on with MYB Textiles in Ayrshire and Sarah Taylor, Research Fellow at Edinburgh Napier University in which they are exploring the feasibility of manufacturing smart textiles within MYB’s Lace Mill. Louise is a designer, illustrator and visual explorer based in Dundee. She goes on adventures with her brushes in a world full of images, marks and patterns. Inspired by her observations on her journeys in the city to things that surround her, she specialises in capturing the magic and passion, responding to projects, place and commissions. Her decorative style retains the hand drawn qualities and she works on commissions as well as on her own range of greetings cards. Louise will be talking about her process from the ideas whirling about in her head to the finished product. Malath is an independent game designer, artist and producer working on experimental and meaningful games. He is establishing Biome Collective, Scotland’s first game collective and co-working space in order to support a community of sustainable independent game makers, and to foster cross sector collaboration. He’ll talk about game design, production and making cool stuff, and look forward to your questions. Joanna is an artist based in Dundee. Having just completed a two month residency at Alice Yard in Port of Spain, Trinidad, Joanna’s recent work explores the connections Scotland has with the Caribbean and how this has shaped our industrial and cultural heritage, and particularly in how this affects our current conversations about nationhood and the artist’s role in nation building. Joanna will talk about a new work she is creating in collaboration with the Dundee Ceramics Workshop and the artistic community of Alice Yard in Trinidad which aims to create a platform for challenging our understanding of space, industry and Scotland’s role in the wider world. Laura is at the end of her Graphic Design degree at DJCAD. Her after uni plans are somewhat alternative as she intends to work as a freelancer from a nomadic design studio her partner and she has set up. Their studio will be a yellow VW camper van and they plan to travel while working remotely for clients at home and abroad. She’ll be sharing the process of developing and designing her own brand Yellow Matilda from start to its present state. Focusing particularly on the story behind the logo design and building our brand ethos. McGinlay Bell is an architectural practice established by Brian McGinlay and Mark Bell. The work of the practice is informed by a strong research and analytical focus on the design process that aspires us to create contemporary, familiar and architectures that are connected to place. Brian and Mark will talk about West Ward Works; their first impressions, some reflections as they’re getting to know it a bit better and the process of design based on the 3D visual and physical model making which they would propose to utilize throughout the project as a set of tools/props to communicate and develop ideas.